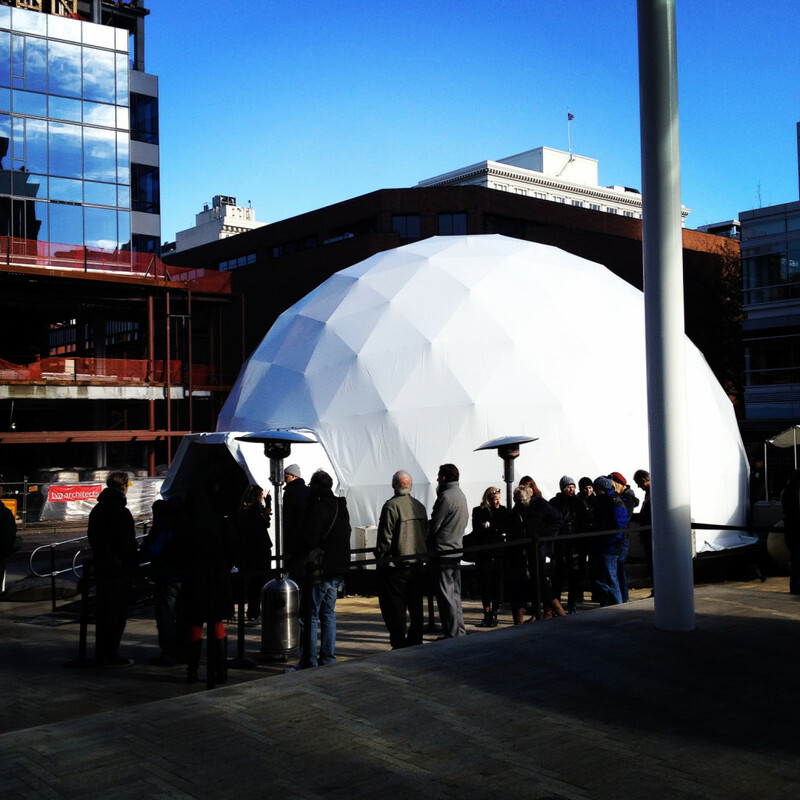 Starting today, a 40-foot dome in Director Park kicks off a multi-city tour for Umpqua Bank. The dome—a digital, interactive structure that fits four people at time—is the centerpiece of Exhibit:Growth, a new Umpqua-commissioned outdoor installation developed by eight artists, including three Portlanders: Blaine Fontana, Aaron Rayburn, and Blaire Saxon-Hill. The dome contains four 8-by-16-foot screens, designed to take away visitors’ peripheral vision, immersing them in an interactive experience intended to evoke growth and change. The screens’ displays respond to visitors’ movements, creating a personalized, metaphorical representation of movement. “It will be an extraordinary experience,” says Eve Callahan of Umpqua Bank. An experience she says hopes will spark financial dialogue—a topic, she believes, under-discussed in our society. Who, after all, helps us take on difficult conversations? Artists do. Artists like Aaron Rayburn. In 2011, Esquire named him “one of the 12 most innovate designers in America.” Aaron, an Oregon native, has collaborated with famous Portland organizations such as Nike, The Portland Timbers, and Wieden and Kennedy. He was working when I called him. “I’ve got paint all over my hands, that’s how it goes,” he said. Umpqua Bank approached him with the idea of growth and human potential, asking him what he could build out of string. Aaron says he wanted to express the building nature of lava, with his artwork. He paused, “Cosmic forces man,” he said. Aaron believes in making bold, strong statements that are surprising and graphic. He strives to make artwork that he would like, realizing that other humans will be drawn to it as well. “Art is supposed to quiet the mind and open the soul,” he says to me. Then he reminisces: born in Portland, moved near the Umpqua river in Southern Oregon. “So Umpqua has always been close to my heart,” he says. Exhibit:Growth will be displayed in Director Park Nov 14 to 23, 11 am to 9 pm daily, before moving on to five other cities.